For a book that started off so well, it is disappointing to see it take such a huge dive. For those unaware, this will be the final issue of this series. Originally a sixth issue was solicited but that seems to have been cancelled. Honestly, this book kind of deserves this fate. First off, the book is called Ghost Rider but hardly has any Ghost Rider in it. 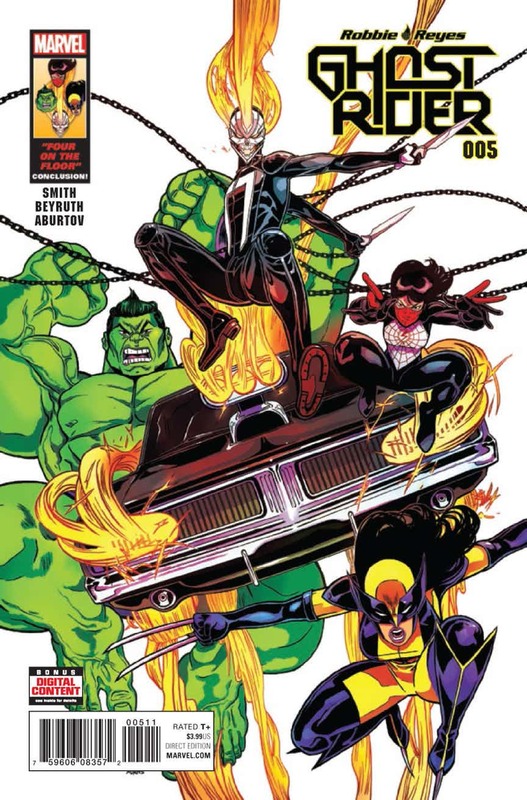 This is more like the oddest team up book that has ever existed and for the most part, the focus has really been on Amadeus Cho rather than Robbie Reyes. When your title character is being shown up in his own book, your creative team is doing something wrong. But let’s jump into this final issue and see how this story ends. Our issue begins where we left off. Robbie has transformed in the Ghost Rider and is fighting off some local thugs who had attempted to kill off Ramon, a reformed gang member. Ramon receives a call and uses the chaos of the situation to get away. Ghost Rider notices this and, not believing that Ramon is reformed, decides to go after him and exact punishment upon him. Just as Robbie catches up to Ramon, they stop in front of a major scene taking place in front of them. It is none other than the purple monster that we’ve been dealing with this story arc. The monster continues to completely decimate the team of Hulk, Wolverine, Silk, and the Agents of S.H.I.E.L.D. in this fight. The team welcomes Ghost Rider to the fight as they are willing to take whatever help they can get at this point. The monster continues to adapt as it bites more and more members of the Agents of S.H.I.E.L.D. and it appears nearly unstoppable until Ghost Rider roars and hops into this car to join the fight. The monster spits out different amalgamations of our heroes in order to fight them but thanks to teamwork, they are able to overcome these monsters. Seeing the struggle, Ramon decides that he wants to help and he grabs a barrel of fuel and lights it. Ramon rides his bike into toward the beast attempting to sacrifice himself in order to save others. Seeing this, Robbie believes that Ramon has changed and uses his powers to save him at the last moment just before the barrel explodes with the creature in it. Ghost Rider walks out from the flames when we realize that the creature is still alive. It jumps out behind him and bites him. However, for some reason, the creature isn’t able to absorb Ghost Rider’s abilities and instead Ghost Rider goes into a rage and unleashes an enormous flame at the creature, burning it away until only a single piece remains. The next day the group examines the dormant piece of the creature and is able to understand more about it and how it copies DNA. 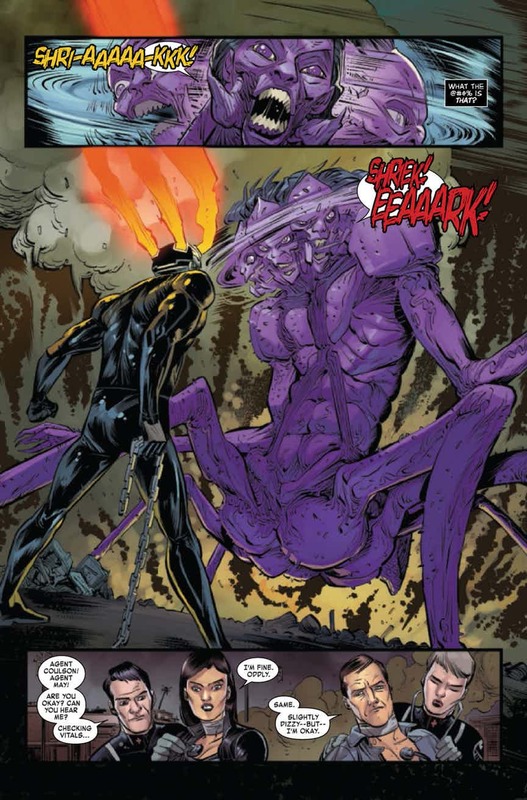 Since Robbie’s Ghost Rider powers aren’t genetic, the creature wasn’t able to copy him. Our issue ends with Robbie and the ghost of Eli Morrow staring at the object and this is where the issue leaves us. I’ll give credit where credit is due. This issue is pretty cool. Granted, the issue is basically one long fight sequence but the art was beautiful and considering where this book has been previously, I have to say that it was a nice change of pace. However, I’m glad this series finally came to an end. This issue may have been good but if the quality of writing going forward was anything like this story arc, I would have been struggling to get through this book. Now, I’m just speculating here, but it honestly doesn’t feel like Felipe Smith wants to be writing this character anymore. 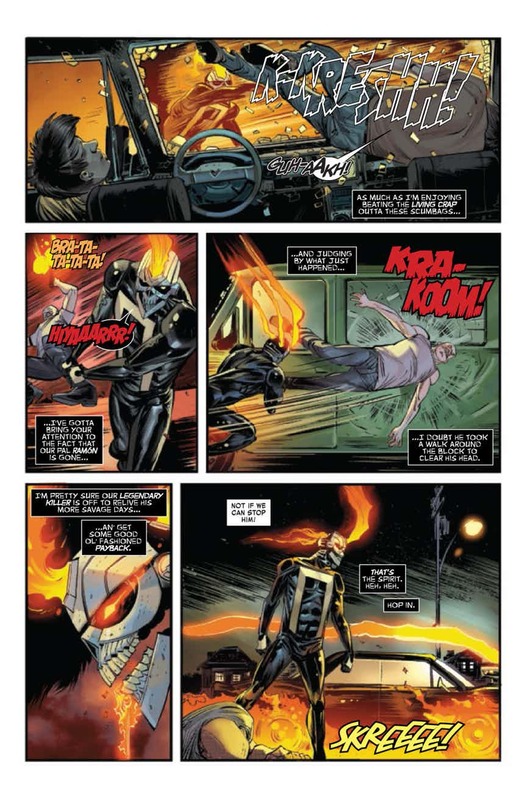 There’s a reason that in the first story arc of the Ghost Rider book, he wrote a team-up story where he focused heavily on characters that weren’t Robbie Reyes. He even made the main villain a monster, something that we see all the time in the Totally Awesome Hulk book. It’s hard to think that someone who really wants to write this character would be doing so much to avoid writing him. Granted, that’s just speculation but it comes through in his writing. Pass this title to someone else and maybe their run will actually do the character justice. While the ending of this story arc provides some epic fight scenes and beautiful art, it doesn’t make up for a poorly written story arc that we had to go through. This series started off well and it’s taken this long to come close to that level of quality once again. At least we ended on a high note but this comic deserves to be cancelled. If you are going to put a creative team on a character, make sure they actually want to write that character.